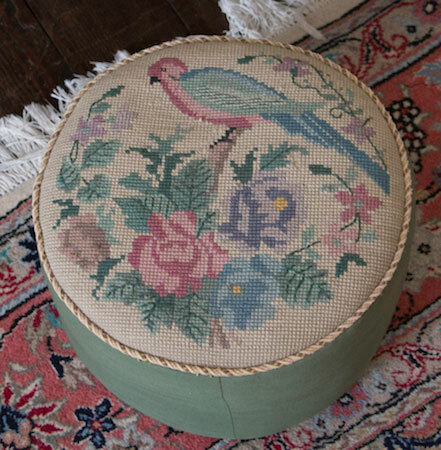 A site on needlework would not be complete without a section on the history of embroidery. Much of the information offered here is based on an old exercise book created by schoolgirl Helen Whiteford in the 1930s, whose drawings have been used to illustrate the page. Embroidery is one of the oldest art forms and has been used to decorate fabrics for ecclesiastical purposes, costume, domestic uses and secular ceremonial articles. In any particular period of English history the emphasis has changed. From the Anglo-Saxon period to the end of the Middle Ages the emphasis was on ecclesiastical works, whereas in Elizabethan times, the Stuart Period and the 18th Century costume was all important. Later, with the introduction of the Guilds and for Masonic purposes, ceremonial embroidery came to the forefront. 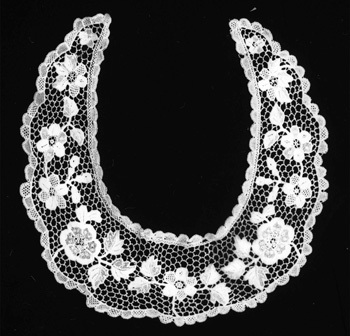 Domestic articles have been enriched throughout the ages, and at times housewives spun their own thread and wove their own material to embroider. With the introduction of Christianity came the development of peaceful crafts. In an document on Ecclesiastical and Domestic work from about 700 A.D. Aldhelm Sherbourne speaks of the skill of the English Embroiderers. Chronicles tell of royal gifts given to the monks, of robes to be used for making vestments and church ornaments. King Edgar, for instance, gave some of his robes to the monks of Ely. 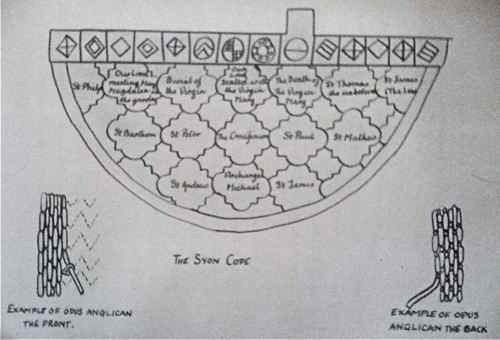 King Athelstan gave a large number of articles to the shrine of Saint Cuthbert. These came to be known as the Durham Embroideries. They were found in the Cathedral in the 19th century. They consist of a stole and maniple, embroidered in red, blue, green, purple and gold thread on a linen ground lined with silk. The design of the stole has the Holy Lamb with figures of the Apostles on each side. Not all of the twelve figures remain intact. An inscription proves the date of creation to be in the 10th Century. Secular and ecclesiastical embroideries are records of great importance. They reflect the social conditions of the times when they were made. The Bayeux Tapestry, for example, shows scenes of the Norman Conquest and has latin inscriptions. It was probably ordered by Odo, Bishop of Bayeux, at the end of the 11th century. From the evidence of the costume and general style the date can be fixed to within a few years after the scenes depicted. There are few records of it through the centuries. In 1476 it was mentioned in the Bayeux Cathedral records. It was kept in the Cathedral and shown on special occasions, such as St John's Day, when it was brought out for eight days. In the Napoleonic Wars it was used as a covering for a transport wagon and sent to Paris. Later it was returned to Bayeux and exhibited in the Hotel-de-Ville. A faithful drawing was made by an Englishman in 1816 and from that drawing engravings were made that have been reproduced in many books. In 1913 the tapestry was moved to the house of the Bishop of Bayeux. Referred to throughout the history of embroidery as The Bayeux Tapestry it is actually an embroidered piece rather than a woven tapestry. A long strip of coarse linen, 230 feet long by 19 and a half inches deep, it is actually made up of several pieces which may have been worked by different people, as there are joins and breaks in the character of the border. The embroidery is worked in two kinds of wool in 5 shades of blue, 2 of green, buff, red and grey. These colors are used with little regard for the true representation, for example there are blue and red legs on the same horse, or green hair on the figures. The stitchery is partly in-laid work and partly in outline (stem stitch). 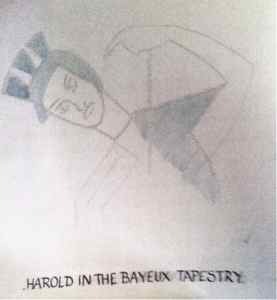 The drawing of the bayeux tapestry scenes are full of life and vigour and the whole presents a fascinating, lively picture... from Edward giving instructions to Harold, to the final flight of the "Angli". The 19.5 inch strip has a narrow 3.5 inch border at the top and bottom, running the whole length, which is filled with all kinds of ornaments: birds, beasts, rural scenes and illustrations of Aesop's Fables. Here and there the border is broken into, by detail of the main scenes. The inscriptions in Latin are finely drawn Roman lettering, obviously the work of an Englishman of learning. Whoever designed the work was an artist of considerable skill; the grouping of the scenes, the dramatic and lively positions of the figures and the considerable detail shows how close and accurate an observer he was of 11th century life. The Bayeux tapestry is a mine of information on architecture, colour, costume and armour. In fact it is the best record we have of the period, work and life of the times. This was the great period of English Embroidery and the high standard of work made England famous throughout the world. There is a sincerity and a dignity in the figures which is obvious in spite of the rather childish drawing. The embroidery was worked on linen, silk or velvet in gold, silver or silver-gilt threads and coloured silks. The special method of this period of the history of embroidery was Opus Anglicanum. It was a type of couching which had the appearance of satin stitch worked in a chevron pattern. On the back the linen threads are in parallel lines with the gold thread encircling them, see the diagram below. Characteristics of the figure work are the special treatment of faces...high foreheads, bearded with shaven upper lip, hair and beard in unnatural colours. Details of birds, lions, leopard heads and foliage of vine, oak and ivy help to make up the designs. The Syon Cope is a splendid example of Opus Anglicanum. In this cope, as in many other embroideries of the time, the linen ground is entirely hidden by embroidery in coloured silks and gold thread. The body of the cope is covered with interlacing quatrefoils outlined in gold, filled with scenes from the live of Christ and the Virgin, along with figures of Saint Michael, the Apostles and six winged seraphim. The ground of the quatrefoils is covered in red embroidery silk, with the intervening spaces in green, and is worked in underside couching in such a way that a chevron pattern is produced on the surface. The features and drapery are worked throughout in fine split stitch, characteristic of this type of work, and most suitable for accurate and delicate drawing with the needle. It dates from the latter half of the 13th century. Another cope, The Tree of Jesse Cope, shows a figure of Jesse, lying on the ground, from whom springs a vine whose branches cover the whole ground of this cope and encircle the various figures. In the middle are David, Soloman and the Virgin with the Infant Saviour. Within the lateral branches are figures of the King and prophets, each holding a scroll inscribed with their names. The cope has been at some time cut into pieces, and parts of it used for other purposes. From the year 1718 to 1857-58 it was kept in the Roman Catholic Chapel at Brockhampton near Havant, Hampshire. It was afterwards in the possession of the Rev. F H Van Doorne at Corpus Christi House, Brixton Rise. It was bought from him by the Victoria and Albert Museum, a wonderful place to visit if you are interested in the history of embroidery. A green-velvet orphrey embroidered with figures of angels and saints has been preserved with the fragments, but it evidently did not belong to the cope originally. Another example of work done around this time were the Catworth Cushions. The embroidered tops of five small cushions were formerly housed in the Catworth Church, Huntingdonshire, were sold to the Victoria and Albert Museum with the permission of the Bishop of the diocese. Worked in gold thread and silks on a silk ground that has faded to a pale brown, they depict figures of the apostles and saints beneath canopies. The shields of arms, belonging to the first Earl of Huntingdon, beneath some of the figures help to date the work. 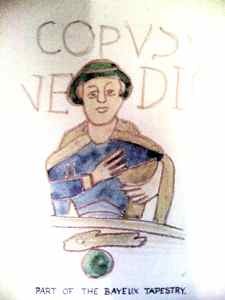 It is assumed that the embroideries have some connection to the wedding of William de Clinton, the Earl, to Juliana de Leyburne, in 1329. Later in the history of embroidery there came a period of revival. This new style was different from the earlier work. Velvet and satin were favourite ground materials and floral forms such as the pomegranate, Tudor rose and fleur-de-lys were used. These often had lines and spangles decorating them. The embroidery was often a panel, superimposed on the richly decorated background of brocade. his page is getting rather long, so I will continue the history of embroidery on another page...taking us from the 16th century forward to the 19th.